Do you pack enough nutrition in your childs lunch-box? Take a look into some of the lunch boxes of school children and you will find potato chips and a pastry or chicken sandwich with no other accompaniment or oily pulao and poories, sometimes only cash for the children to buy whatever they like. Working parents say that they do not have time to look into the nutrition their children require and house-maids do not know what the child should be given from the wide variety of goodies in the kitchen. So, the easiest way out is to give whatever the child asks for. Mothers who do not work too, give in to the child's stubbornness and ignore nutrition in the lunch box. High fat foods, high sugar intake, and highly refined foods are showing up as heart disease, obesity, diabetes, and so on. Atherosclerosis (narrowing of the arteries) does not start suddenly at the age of 50 or 60 but begins in the younger years. It largely depends on the kind of foods eaten during the growing years. Children are bombarded with advertisements and free gifts which lure them into demanding unhealthy foods. Providing them with cash for lunch only encourages them to buy the junk foods since no one is around to check what goes into their stomach. As the intake of unhealthy foods increase, we will see a lot of children with weight problems and other diseases associated with overweight. It will also decrease the immunity required to fight infections. Another reason for packing high fat foods in the lunch box is when some mothers want their slim children to gain weight. They force-feed the kids with empty calorie foods hoping to make them fat and so-called healthy looking. Maintaining ideal or near ideal weight is important at all ages. Obese children are not always healthy and slim ones are not always undernourished. Some children carry their breakfast to school because their day begins early. Breakfast is as important a meal as lunch: A research summary report in Update said that an international symposium of leading research scientists has found that the breakfast meal enhances memory, learning and physical performances of children and adults. Breakfast can do all this good only if it is well planned and eaten. Whether it is breakfast or lunch, the meal which is carried in the lunch-box is as important as the others eaten at home. Since most school-going children depend on their lunch for part of the day's nutrition, it is important for the mothers to ensure that nutrition is available. • Present the meal in an attractive manner in order to tempt the children to eat. 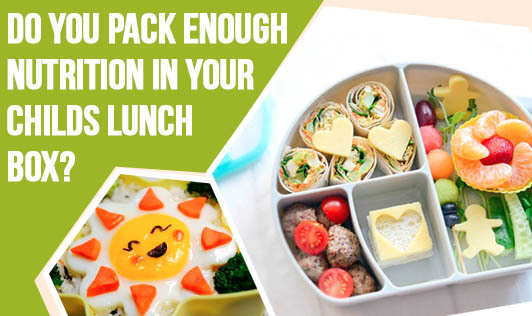 • Keep in mind colour, texture, variety and nutrition of the food packed in the lunch-box. • Avoid highly refined and oily foods. Foods high in sugar and salt should be kept to a minimum. • Ensure a fairly balanced meal. • Guide the children to choose foods that will build health. Children should learn about healthy foods at a young age and it is up to parents to inculcate good eating habits in them if they want them to grow up to be healthy adults. So, next time you pack a lunch for your child, make sure you give more preference to nutrition.